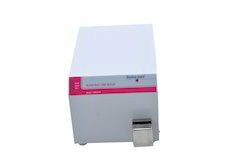 We are considered to be one of the leading manufacturers and suppliers of a commendable range of Blood Bag Tube Sealers. The offered product with high efficiency seals blood bags for the purpose of preserving them. This diverse range comprises of Blood Bag Tube Sealers, Blood Bag Tube Sealers Hand Held and Blood Bag Tube Sealers. Bioline India Blood Bag Tube Sealer heavy duty and be able to seal the blood bag etc quickly and effectively. Ø Gently for seal the tubing with no hemolysis using radio frequency. Ø Sealer runs on both mains and battery (more than 10hrs back up and charger). Ø Portable hand unit sealing hand with RF cable 1.9 meter. Ø No warm up time required. Ø Easy separation of tube segments after the sealing. Ø Electrodes are protected by a cover. Ø Sealer runs on both mains and battery (more than 10hrs back up and charger). Back up battery and seal more than 1000 seals on PVC-tubes in continuous mode with fully charge battery. Ø Suitable auto voltage corrector with spike protector available. Blood Bag Tube Sealer seal tube of 4-6 mm diameter. Seal with in 1.5 second / tube. Indication sealing. 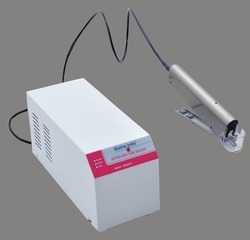 Sealer based on RF dielectric heating which gives unique sealing finish and RF single is applied only after the tube is fully squeezed. Stand wide input voltage fluctuation. Lightweight, portable and heavy duty. Sealing time is variable from 0.5 to 3 sec. Wide seal of 2 mm thickness. Able to seal all blood bag tubes. Weight : Approx 4 kgs. Sealer based on RF dielectric heating which gives unique sealing finish and RF single is applied only after the tube is fully squeezed. stand wide input voltage fluctuation. Looking for Blood Bag Tube Sealer ?